Kitty Mischief. | details in the fabric.. 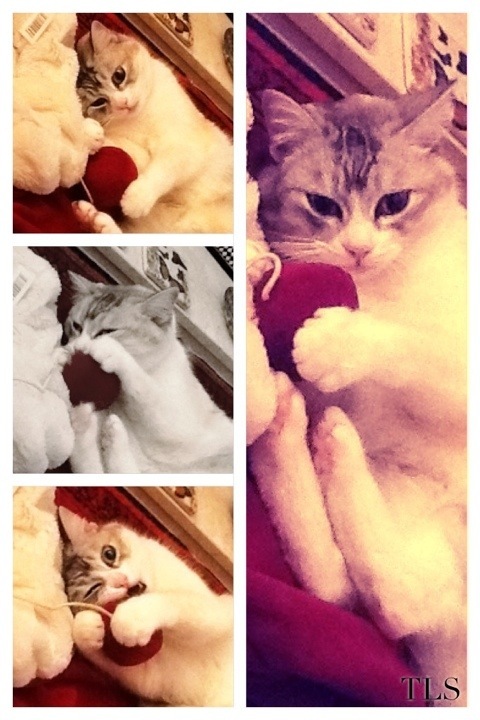 Photos below: Casper playing with his Christmas present! It’s so wonderful to have bought Casper something that he actually plays with. More often than not, he either ignores any presents I give him, or uses them for something completely different. To list just a few..
A special ‘igloo’ indoor bed that we bought him, because he is forever hiding inside things. He never once went inside, and instead slept on top of it. Deluxe scratch post with a hiding box at the bottom, and a bed at the top. A cat lead. I thought I’d get one on the off chance he’d like it. A treat dispensing toy. The idea was that the cat plays with the toy, rolling it on the floor and moving it around, and you’d fill it with treats which would fall out when the toy was being played with. Casper was completely disinterested, turning his nose up and refusing to even try it out. He merely gave it the evil eye and flounced off. However, as soon as something isn’t a toy, and isn’t meant for kitties, I have Casper’s full attention. Any piece of string, any plastic bag, any cardboard box. He’s in there like a flash, merrily playing away, hiding in the box, chasing normal (i.e. toxic) bubbles, playing around with the treat box to try to open it and get some treats.. The list is endless. I guess cats will be cats. They’re much like kids in this sense – a lot of children would have more fun making a big old cardboard box into a rocket, at virtually no cost, than one of those big expensive plastic cars you can buy for kids nowadays. What a wonderful fluffy nuisance he is. Previous “Long live living, if living can be this..” Next Ariel is such a ponce. you can’t post too much about cats. Aww! Poor thing! I assume this was about the time you were aiming a spray bottle in her face, too? Casper doesn’t completely escape from it though.. He jumped in a box the other day and my dad went and put the lid on it! Poor kitty. Ha! Love it! My cat and I weren’t really friends…more like roommates. She wasn’t a nice cat haha. You can never do too many posts about Casper, he’s so cute!